Marvel Architects has given urban edge to a pivotal part of Brooklyn with a hotel that blends edgy angles with panoramic views. 1 Hotel Brooklyn Bridge defines the northern extent of the mixed-use Brooklyn Pierhouse development, just south of the Brooklyn Bridge. The design includes 195 hotel rooms, three dining venues, an event space, spa, a rooftop pool and bar, a 300-car parking garage, and two retail spaces. The 11-floor concrete, glass, and steel new-build serves as an improved link between the industrial Furman Street and the open space of the Brooklyn Bridge Park. Hotel guests, apartment owners and pedestrians alike can enjoy the nearby park and Pier 1 in Brooklyn from bars and seating areas with vast plate glass widows. Jonathan Marvel, co-founding principal at Marvel Architects, said the multi-award winning design was “designed in a way that allows visitors to be part of the park and experience the harbor-front as much as possible”. 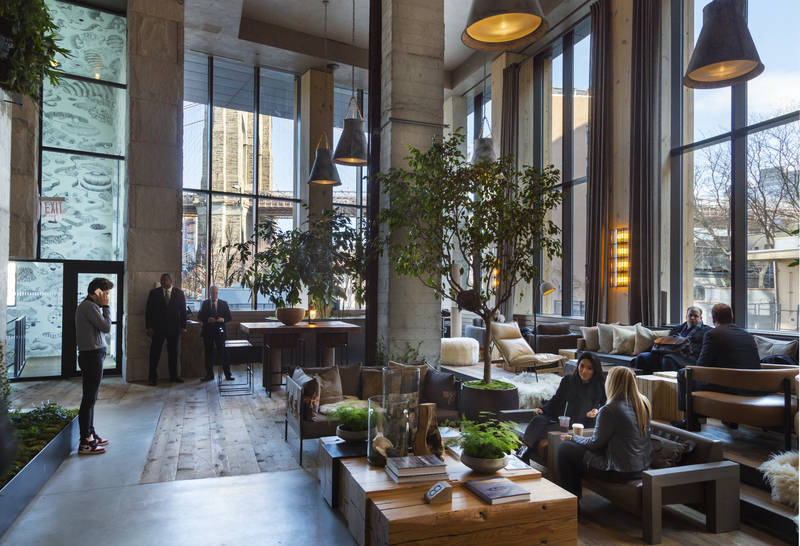 1 Hotel Brooklyn Bridge was led by Marvel working in partnership with with Starwood Capital, Toll Brothers, INC Architecture & Design and Michael van Valkenburgh Associates.